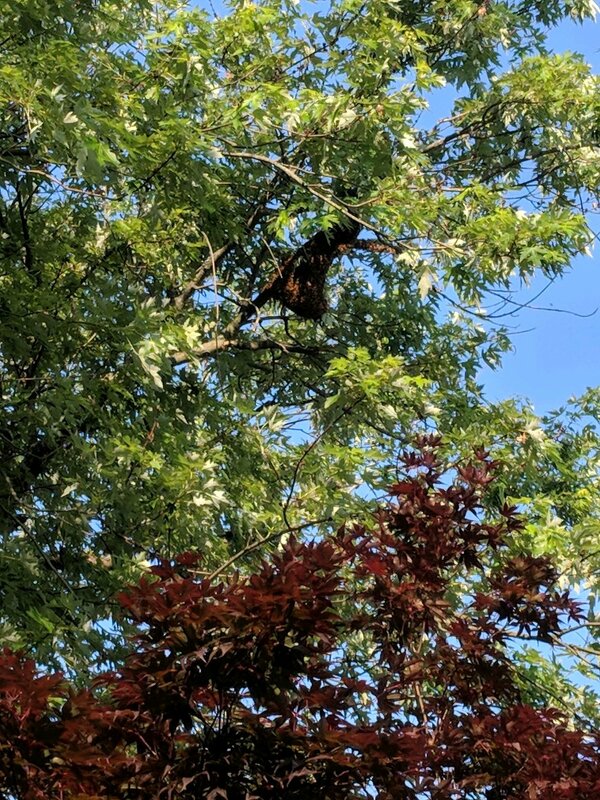 Swarming in the Observation Hive — Masterson's Garden Center, Inc. If you've visited our store, you probably noticed the observation hive located in our beekeeping department. This hive is really neat because it gives us a chance to watch the inner workings of a live hive right in the store. The hive only contains 8 frames, which is a small size relative to a typical set up that would contain 16 - 20 frames. Because of the small size, we expect this colony to swarm regularly. (We're ok with that. More on that in another post later...) Well, the hive swarmed this week and we want to share the story. the old queen and up to half of the workers leave the hive in an initial flight and settle nearby while scouts go out and find a new hive location. For weeks, the hive had been looking very crowded, wall to wall bees, we couldn't see much of the comb through the bees because there were so many. We saw a queen cell being formed about three weeks ago. We knew swarming was imminent. But they didn't go! For two weeks, we kept thinking, "Today's gotta be the day," but they stayed and the hive just kept getting more and more crowded. Finally, last Sunday, they swarmed out of the hive. They ended up congregating in the giant silver maple just outside the front doors of the store. About 50 - 60 feet up in the air. 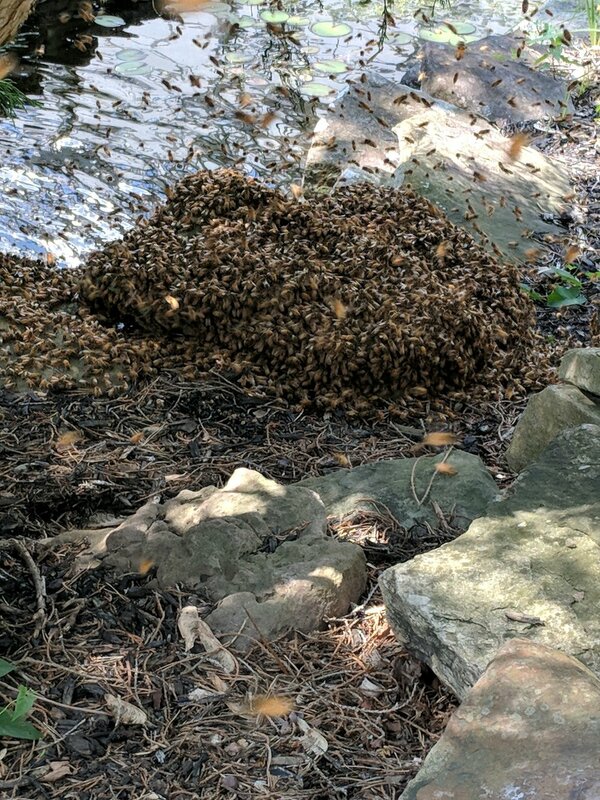 We decided that we were not going to try to collect this particular swarm, but wave goodbye to a really great queen. The next day, as I was at the counter in the store, I heard a buzz coming from outside and went out to see the swarm mobilizing. They flew around for a bit in crazy circles...then went right back into the observation hive. Not what we expected. There were a few hundred or so bees that did not make it back into the hive, and they began to congregate on a pallet in the parking lot. Rain was coming, and I didn't want to just leave this tiny cluster out and exposed, and for several reasons I suspected that there was a queen in that cluster. With my hand, I just scooped up the little cluster of bees and was putting them into a nuc box with no plan other than to get them out of the rain. Guess who was sitting right in my hand with the second scoop of bees? The queen, of course! Putting her back into the hive isn't really an option, so Mike took her and her small group of friends home with him that night and added some brood frames from another colony. The good queen will live on. But what about the STILL overcrowded observation hive? Well, they swarmed again on Tuesday, just about 24 hours after they had returned from their first attempt. Again, waaay up in the silver maple. 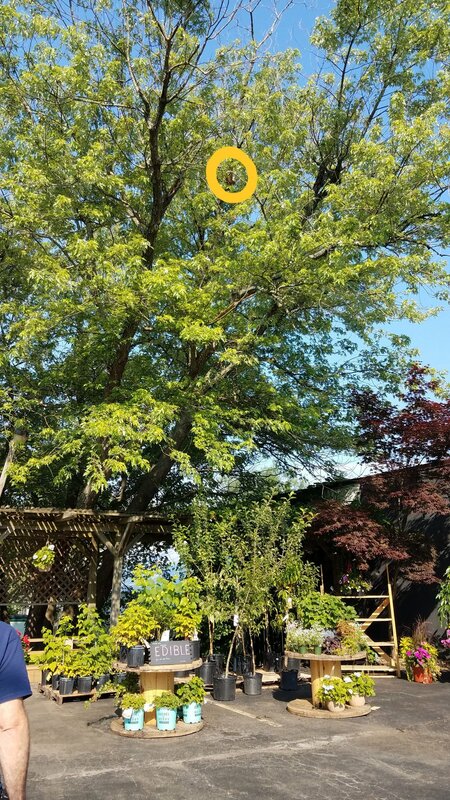 This time, they hung out in the tree for another 24 hours or so, then started the crazy flying and buzzing that meant they were on the move. Normally, this would mean that the scouts had found a great new hive location and they would all move there. Not these bees! They decided to drop down to the ground and just hang out there. Again, not what we would expect. At that point, Mike used the bee vac to gather the bees from the ground and has since re-homed them. There were A LOT of bees in this swarm. But maybe no queen? Or maybe there was a second one in the hive and she's with the swarm now? We'll wait and see what happens! Here's what the observation hive looks like now. If you saw it before they swarmed, you'll recognize that the number of bees in here is dramatically less than before. Now we watch for queens (or signs of them) in the observation hive and in the swarm!